Two years ago on July 14, 2015, the New Horizon spacecraft reached Pluto. To celebrate this anniversary NASA released a Pluto flyby video. Using actual New Horizons data and digital elevation models of Pluto and its largest moon Charon, mission scientists have created flyover movies that offer spectacular new perspectives of the many unusual features that were discovered and which have reshaped our views of the Pluto system – from a vantage point even closer than the spacecraft itself. Digital mapping and rendering were performed by Paul Schenk and John Blackwell of the Lunar and Planetary Institute in Houston. New Horizons is a space probe launched by NASA on 19 January 2006, to the dwarf planet Pluto and on an escape trajectory from the Sun. It is the first man-made spacecraft to go to Pluto. Its flight took eight years. It arrived at the Pluto–Charon system on July 14, 2015. It flew near Pluto and took photographs and measurements while it passed. At about 1 kilobit per second, it took 15 months to transmit them back to Earth. The primary mission of New Horizons is to study Pluto and its system of moons. The secondary mission is to study any objects in the Kuiper Belt if something became available for a flyby. The space probe set the record for the fastest man-made object ever launched, with the Earth-relative speed of about 16.26 km/s, although, arguably, the Helios probes got a faster Sun-relative speed. It used a gravity assist from Jupiter to get its high speeds without having to burn as much monopropellant (weak rocket fuel) as needed to fly directly to Pluto. ATI instructors who helped plan, develop and engineer the New Horizons Mission. These include the following engineers and scientists, with their bios and links to their related ATI courses. Dr. Alan Stern is a planetary scientist, space program executive, aerospace consultant, and author. In 2010, he was elected to be the President and CEO of The Golden Spike Company, a commercial space corporation planning human lunar expeditions. Additionally, since 2009, he has been an Associate Vice President at the Southwest Research Institute, and since 2008 has had his own aerospace consulting practice. Dr. Stern is the Principal Investigator (PI) of NASA’s $720M New Horizon’s Pluto-Kuiper Belt mission, the largest PI-led space mission ever launched by NASA. New Horizons launched in 2006 and is arriving July 14, 2015. Dr. Stern is also the PI of two instruments aboard New Horizons, the Alice UV spectrometer and the Ralph Visible Imager/IR Spectrometer. Chris DeBoy leads the RF Engineering Group in the Space Department at the Johns Hopkins University Applied Physics Laboratory, and is a member of APL’s Principal Professional Staff. He has over 20 years of experience in satellite communications, from systems engineering (he is the lead RF communications engineer for the New Horizons Mission to Pluto) to flight hardware design for both Low-Earth orbit and deep-space missions. He holds a BSEE from Virginia Tech, a Master’s degree in Electrical Engineering from Johns Hopkins, and teaches the satellite communications course for the Johns Hopkins University. Dr. Pittelkau was previously with the Applied Physics Laboratory, Orbital Sciences Corporation, CTA Space Systems (now Orbital), and Swales Aerospace. His experience in satellite systems covers all phases of design and operation, including conceptual design, implementation, and testing of attitude control systems, attitude and orbit determination, and attitude sensor alignment and calibration, control-structure interaction analysis, stability and jitter analysis, and post-launch support. His current interests are precision attitude determination, attitude sensor calibration, orbit determination, and optimization of attitude maneuvers. Dr. Pittelkau earned the B.S. and Ph. D. degrees in Electrical Engineering from Tennessee Technological University and the M.S. degree in EE from Virginia Polytechnic Institute and State University. Douglas Mehoke is the Assistant Group Supervisor and Technology Manager for the Mechanical System Group in the Space Department at The Johns Hopkins University Applied Physics Laboratory. He has worked in the field of spacecraft and instrument thermal design for 30 years, and has a wide background in the fields of heat transfer and fluid mechanics. He has been the lead thermal engineer on a variety spacecraft and scientific instruments, including MSX, CONTOUR, and New Horizons. He is presently the Technical Lead for the development of the Solar Probe Plus Thermal Protection System. He was the original thermal engineer for New Horizons, the mechanical system engineer, and is currently the spacecraft damage lead for the flyby Hazard Team. Other JHU/APL are currently teaching the Spacecraft Thermal Control course. Steve Gemeny is a Principal Program Engineer and a former Senior Member of the Professional Staff at The Johns Hopkins University Applied Physics Laboratory, where he served as Ground Station Lead for the TIMED mission to explore Earth’s atmosphere and Lead Ground System Engineer on the New Horizons mission to explore Pluto by 2020. Mr. Gemeny is an experienced professional in the field of Ground Station and Ground System design in both the commercial world and on NASA Science missions with a wealth of practical knowledge spanning nearly three decades. Mr. Gemeny delivers his experiences and knowledge to his ATIcourses’ students with an informative and entertaining presentation style. Mr Gemeny is Director Business Development at Syntonics LLC, working in RF over fiber product enhancement, new application development for RF over fiber technology, oversight of advanced DOD SBIR/STTR research and development activities related to wireless sensors and software defined antennas. John Penn is currently the Team Lead for RFIC Design at Army Research Labs. Previously, he was a full-time engineer at the Applied Physics Laboratory for 26 years where he contributed to the New Horizons Mission. He joined the Army Research Laboratory in 2008. Since 1989, he has been a part-time professor at Johns Hopkins University where he teaches RF & Microwaves I & II, MMIC Design, and RFIC Design. He received a B.E.E. from the Georgia Institute of Technology in 1980, an M.S. (EE) from Johns Hopkins University (JHU) in 1982, and a second M.S. (CS) from JHU in 1988. Timothy Cole is a leading authority with 30 years of experience exclusively working in electro-optical systems as a system and design engineer. While at Applied Physics Laboratory for 21 years, Tim was awarded the NASA Achievement Award in connection with the design, development, and operation of the Near-Earth Asteroid Rendezvous (NEAR) Laser Radar and was also the initial technical lead for the New Horizons LOng-Range Reconnaissance Imager (LORRI instrument). He has presented technical papers addressing space-based laser altimetry all over the US and Europe. His industry experience has been focused on the systems engineering and analysis associated development of optical detectors, wireless ad hoc remote sensing, exoatmospheric sensor design and now leads ICESat-2 ATLAS altimeter calibration effort. Robert C. Moore worked in the Electronic Systems Group at the JHU/APL Space Department since 1965 and is now a consultant. He designed embedded microprocessor systems for space applications. He led the design and testing efforts for the New Horizons spacecraft autonomy subsystem. Mr. Moore holds four U.S. patents. He teaches for ATIcourses and the command-telemetry-data processing segment of “Space Systems” at the Johns Hopkins University Whiting School of Engineering. Jay Jenkins is a Systems Engineer in the Human Exploration and Operations Mission Directorate at NASA and an Associate Fellow of the AIAA. His 24-year aerospace career provided many years of experience in design, analysis, and test of aerospace power systems, solar arrays, and batteries. His career has afforded him opportunities for hands-on fabrication and testing, concurrent with his design responsibilities. He was recognized as a winner of the ASME International George Westinghouse Silver Medal for his development of the first solar arrays beyond Mars’ orbit and the first solar arrays to orbit the planet, Mercury. He was recognized with two Best Paper Awards in the area of Aerospace Power Systems. 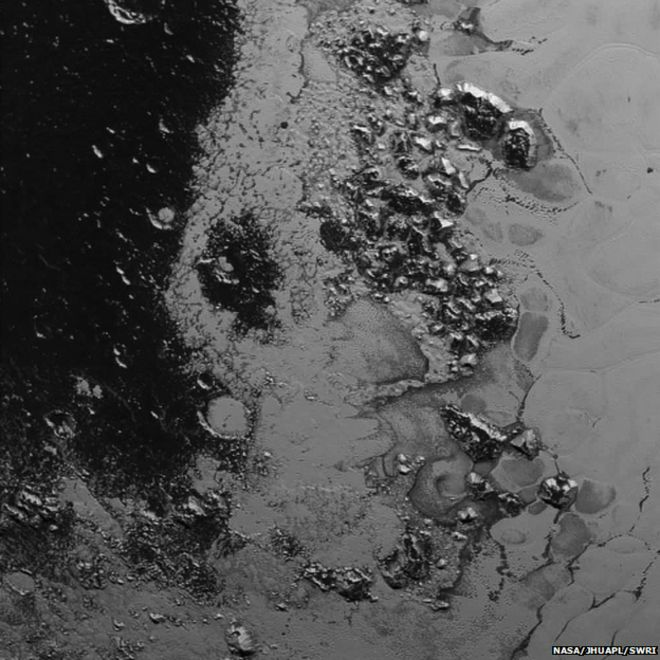 The latest images from the New Horizons spacecraft have revealed another range of ice mountains on Pluto. The frozen peaks were found on the lower-left edge of the dwarf world’s “heart” and are 1-1.5km-high. They sit between a patch of icy, flat terrain, called Sputnik Planum, which scientists believe is less than 100 million years old, and a dark area dating to billions of years ago. Jeff Moore, who leads the geology, geophysics and imaging team on New Horizons, said: “There is a pronounced difference in texture between the younger, frozen plains to the east and the dark, heavily-cratered terrain to the west. The newly spotted mountains are about 110km away from another range, which is now known as Norgay Montes, which appeared in some of the first images returned from last week’s fly-by. Those peaks are much more lofty: standing at about 3.3km-high, they rival the Rocky Mountains in size. 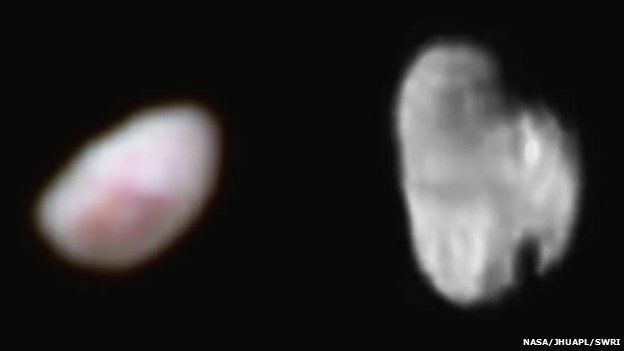 The New Horizons spacecraft has also zoomed in on two of Pluto’s five moons. An image taken by the probe’s high resolution camera, Lorri, reveals the most-detailed-view yet of Hydra, which is about 55km-long and 40km-wide. The little satellite seems to have at least two large craters, and its top half looks darker than its bottom, suggesting the make-up of its surface may be varied. Another picture snapped by the Ralph instrument reveals Nix with its colours boosted, which is a technique that helps scientists to identify details on the surface they would otherwise be unable to see. Through this, the team has identified a reddish spot, which may be a crater. “Additional compositional data has already been taken of Nix, but is not yet downlinked. It will tell us why this region is redder than its surroundings,” said mission scientist Carly Howett. Keep hearing about Pluto? How much do you know about NASA’s mission that some have said is a historic first 50 years in the making? This image of Pluto from New Horizons’ Long Range Reconnaissance Imager (LORRI) was received on July 8, and has been combined with lower-resolution color information from the Ralph instrument. When we think about the ground system on a space mission we tend to consider all the systems associated with commanding, receiving and archiving telemetry, and all the communications systems and equipment that makes that all work. We plan contingencies, and redundancies, we back up everything in multiple formats, and on long duration missions like New Horizons someone eventually has to address “how are we going to keep all that stuff on the ground running for 10 – 20 years”- and produces a Longevity Plan. But once everything is all setup, and operational, and all the staff are at their stations on launch day – having already given the first “Go For Launch” pole responses with 5 hours till launch – You have to wonder, did anyone ever consider what to do if the entire JHU/APL campus goes dark! No one had. And with a newly installed cutover for the main (PEPCO) power feed providing an automatic transfer to a backup (BGE) feed no one expected to ever need the capability, let alone that it would failed to transfer. It did- at about 5:30 am on launch day while I was on console at KSC. The rapid application of backup generators to sustain the Mission Operations Center at APL only solved half of the issues… Network switches and routers were scattered across campus, most only running on UPS Power until that failed too… there was no cooling air to keep everything operating within normal temperatures on January 18, 2006… Things were going from bad to worse and the Mission System Engineer was heard to say “ I’ve seen how quickly a Launch day can get deep into the contingency plan, I’m not starting a launch when we are already this deep into solving unplanned contingencies”. This resulted in the launch being scrubbed and resumed on January 19th after power and environmental control systems were restored campus wide at APL. Fortunately, I spent the time that afternoon to write the whole thing up in case I was asked to give a report, I’ve got pictures of generators outside Building 13, with external air handlers and chillers hosed up to blowers and leaks flooding the hallways… It was a ZOO!. I was safe at KSC and we restarted the count for a successful launch on the 19th. Steve Gemeny teaches Ground Systems Design & Operations http://www.aticourses.com/ground_systems_design.htm course for ATICourses. The New Horizons Mission to Pluto–Ten Experts Who Worked Behind-the-Scenes On the New Horizons Mission and Who Teach for ATIcourses. Applied Technology Institute (ATI) is proud to have several course authors, instructors and subject-matter experts that led portions of the New Horizons Mission and/or were directly involved in the project, which began in 2003. This is the countdown time to the New Horizons Missions closest point of approach to Pluto; The spacecraft is on track toward an “aim point” approximately 7,750 miles above Pluto’s surface on July 14, but meaningful data is already streaming in to JHU/APL and NASA. This is the original 2003 press release describing the New Horizons Mission. Boulder, Colo. – April 9, 2003 – This week NASA authorized the New Horizons Pluto-Kuiper Belt (PKB) mission to go forward with preliminary spacecraft and ground system construction. New Horizons is led by the Southwest Research Institute(r) (SwRI(r)) and the Johns Hopkins University Applied Physics Laboratory (APL). Neither Pluto nor Kuiper Belt Objects have ever been explored by spacecraft. In July 2002, the National Research Council’s Decadal Survey for Planetary Science ranked the reconnaissance of Pluto-Charon and the Kuiper Belt as its highest priority for a new start mission in planetary science, citing the fundamental scientific importance of understanding this region of the solar system. author. In 2010, he was elected to be the President and CEO of The Golden Spike Company, a commercial space corporation planning human lunar expeditions. Additionally, since 2009, he has been an Associate Vice President at the Southwest Research Institute, and since 2008 has had his own aerospace consulting practice. John Penn is currently the Team Lead for RFIC Design at Army Research Labs. Previously, he was a full time engineer at the Applied Physics Laboratory for 26 years where he contributed to the New Horizons Mission. He joined the Army Research Laboratory in 2008. Since 1989, he has been a part-time professor at Johns Hopkins University where he teaches RF & Microwaves I & II, MMIC Design, and RFIC Design. He received a B.E.E. from the Georgia Institute of Technology in 1980, an M.S. (EE) from Johns Hopkins University (JHU) in 1982, and a second M.S. (CS) from JHU in 1988. Jay Jenkins is a Systems Engineer in the Human Exploration and Operations Mission Directorate at NASA and an Associate Fellow in the AIAA. His 24-year aerospace career provided many years of experience in design, analysis and test of aerospace power systems, solar arrays, and batteries. His career has afforded him opportunities for hands-on fabrication and testing, concurrent with his design responsibilities. He was recognized as a winner of the ASME International George Westinghouse Silver Medal for his development of the first solar arrays beyond Mars’ orbit and the first solar arrays to orbit the planet Mercury. He was recognized with two Best Paper Awards in the area of Aerospace Power Systems.